I have a love-hate relationship with interior decorating magazines. They are full of good ideas — for people with money. Consider this advice: The cheapest way to remake a space is with paint. Yes, repainting the walls or your furniture is one of the more affordable ways to redecorate. However, I still cringe when I repeat this mantra to other budget decorators because I remember a time in my life when I was too poor to afford $60 in paint. Also, even if I had the money to repaint the places I lived in when I was a starving student (dorm rooms, my office), they didn't allow me to paint over the high gloss, Navajo White paint that covered the walls, ceilings, and moldings like a membrane of sadness. 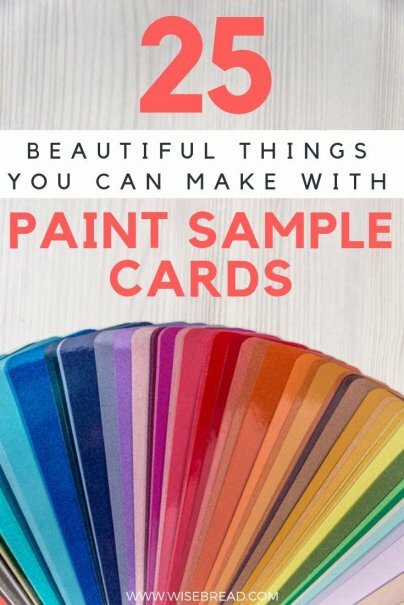 Fortunately, there's a fantastic, free design tool available at every paint store that you can use to spiff up your lodging: paint card (or chip) samples. In researching this story I realized that many of these projects are scalable. You can scale greeting card instructions up to make wall murals, table tops, and headboards, and scale quilt patterns down to make tiny art pieces. Use this list as a jumping off point! Well, almost. For the cost of a butterfly stamp punch you can create a kaleidoscope of butterflies anywhere you want. (Vocabulary geeks please note that kaleidoscope is the actual collective name for a group of butterflies, I'm not just making a paint chip color pun)! Frame your paint chip butterfly collection under glass as a charming reference to the real thing, create 3-D sculptures, or use them to decorate your walls, gifts, or cupcakes. Turn a paint chip into a gift tag or bookmark for your favorite bibliophile or design maven. I will see your Jonathan Adler tea towel, and raise you a Thanksgiving table runner, a monogrammed door placard, and this giraffe family. Own your own pixelated Van Gogh, Vermeer, Munch, Magritte, or da Vinci, with the help of Pantone color chips. 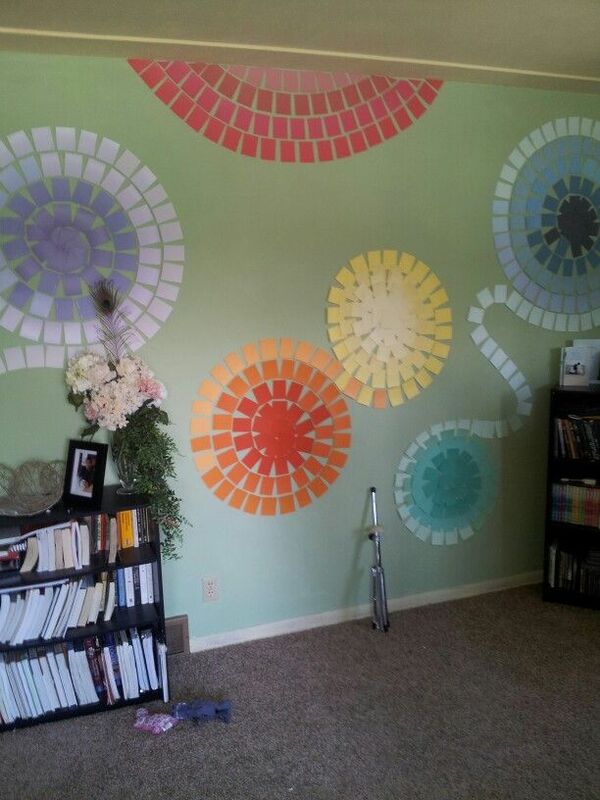 Turn your leftover Pantone chips from your pixelated masterpiece project into magnets. Ixxi is a Dutch company that allows you to create large-scale wall art from a single image. You can get the same effects by using old cross-stitch, needlepoint, or intarsia knitting patterns and paint chips. Replicate your favorite midcentury public art in paper tiles. This can be a simple as recreating the rainbow pattern from your public library's bathroom to the complexity of Sir Eduardo Paolozzi's mosaic murals in the Tottenham Court Road tube station. Broken full-length mirrors are one of my favorite things to trash pick because it's so easy to turn the frame into a custom headboard or panoramic art piece. Use the work of midcentury artists like the Akermans as inspiration for your own unique tabletops or wallpaper. And all your paint chips too! Replicate your favorite 8-bit video game art using paint chips. What do you mean when you say that Space Invader isn't chic? Unpossible. Because of their similar weight, just about any craft involving upcycling old Christmas cards can be used to upcycle paint chips. Because I am an architecture nerd, my favorite way to preserve favorite holiday cards is to turn them into these geodesic ornaments. For a video tutorial on how to make these go here. Unleash the stylist within with this paper wreath. This would make a lovely centerpiece or host gift for holiday parties. When did bunting become a thing? While I wasn't paying any attention, DIY garlands have overtaken the holiday crafting scene. And by holiday, I mean any holiday. Check out this $17.50 Halloween pennant garland you could make for much less. Or this mod Martha Stewart bunting you could use to decorate your aluminum Christmas tree. Or this candy corn bunting you could make at Thanksgiving for that one person in your life who insists that candy corn is delicious and not disgusting. Or this ombre heart garland for Valentine's Day. Or this Easter garland inspired by plastic Easter eggs. For anyone who scrapbooks, paint chips are an obvious raw material just waiting to be turned into gift tags, ribbon, and of course, cards for every occasion. Did you just finish repainting your new pad? Stamp or print your new address onto paint chips to create these clever moving announcements. Cover the back of large chips with a white sticker, then stamp, and mail like a postcard. Leftover tiles? Paint chips? Marry two common renovation leftovers into these swell coasters. If you can make a coaster, you can decoupage a tabletop. Use photographs and paint chips to create this lightweight charm necklace. When I was in kindergarten, my aunt made me a set of these animals out of leftover colored plastic sheeting, but paint chips will work just as well. This site has free animal templates, but don't stop there! Show your kids the assembly technique and then let them draw their own zoo full of fantasy animals. All you need to create this learning tool for toddlers are paint chips, clothespins, a hot glue gun, and scissors. Turn your kid's phonics lesson into a portable game with paint chip flash cards. Use this basic technique to create paper art inspired by Panamanian Molas. Or create sophisticated paper sculptures and textured wall coverings a la Maud Vantours. I'm not sure how and where I would ever use these arrows, but this project proves that you can make stylish party decorations out of the contents of your junk drawer. For extra thriftiness, I would substitute bamboo takeout chopsticks instead of paying for wood doweling. While I am not sure how I would use decorative paint chip arrows, I am totally sure that paint chip pinwheel straws will be featured props at the next house warming party I attend. Combine ornament and bunting projects to create shockingly chic mobiles for babies and bohemians. How cute are these hot air balloons? Cover an ugly fixture with this glamorous paper shade. I thought I had invented a new upcycle when I used my old paint chips as labels for my file boxes. Even from across the room I know what is in every box just from the color of the paint chip! Yay organization! My feeling of genius was short lived when I found this design maven's blog. Her custom file tabs made from old paint chips make me want to run out and buy the Rolodex that I don't need. What's better than a list? A color-coded list that also acts as a bookmark for your Filofax. Why have a white board calendar, when you can match your dry-erase schedule to your décor? 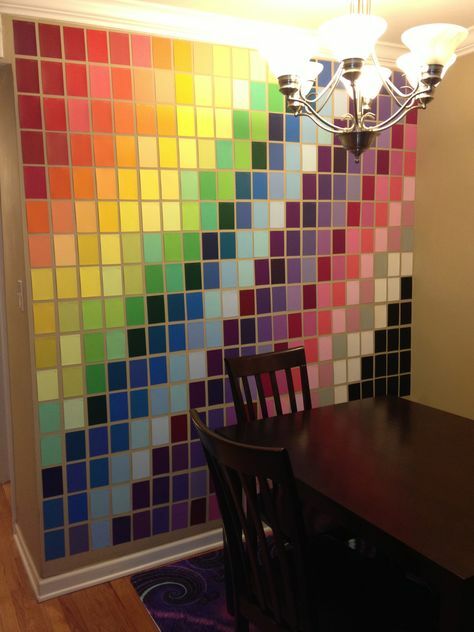 Do you have a favorite upcycle project for paint chips? Please share your design savvy with your fellow readers in the comments below. How do I get hold of large quantity of paint chips without paying lots of money? I love all the crafts and art but where do people get their supplies? You can usually get paint chips for free at home improvement stores. I've never tried to carry them out in bulk, but I've left with 10 or more when I wasn't sure exactly what colors I was painting a room. You can also ask around and see if any of your friends or family have some left over from renovating.